The power – 1kW is sufficient to heat up a 10-12 square meter of space in a room with 2,5m ceiling. 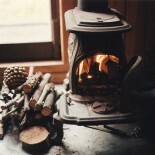 When you choose a wood burner, you should pick one in accordance with the room size. This entry was posted on September 2, 2014 by jbellamy1 in Fireplace, Stove, Tips and Advices.